I really love how that first panel came out, I spent forever working on all the details. So here we have a new location, and a new character! 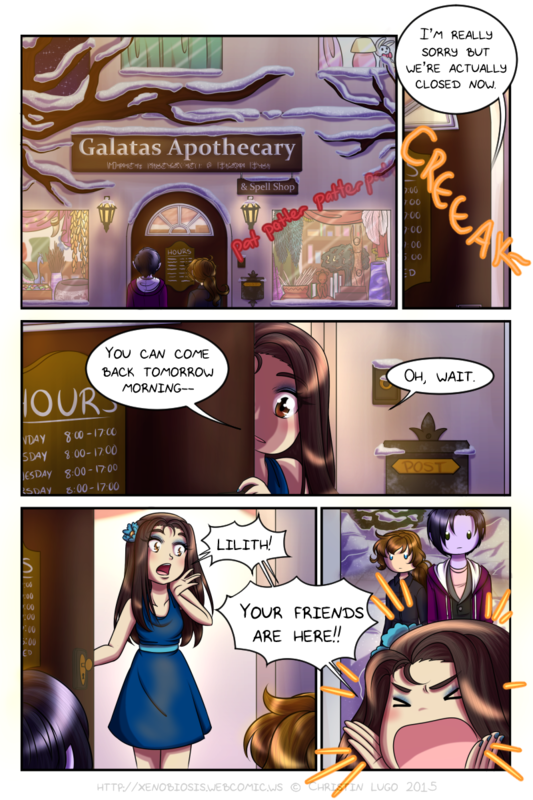 The Galatas Apothecary was one location I really, really, REALLY wanted to draw just because there was so much stuff I could cram in there. I really wanted a mixture between a typical witch's house, a Studio Ghibli background, a new-age witchcraft/psychic shop, and the white houses you find on the Greek islands and I think I hit a pretty solid middle ground. There's all kinds of weird, esoteric junk everywhere and vases and jars and bottles and bowls full of gods-know-what kinds of herbs and mixtures all over the place. My original concept for the place had the large tree growing through the house (like the builders just built the house around the tree) but I decided against it since the building is in a more urban area than I initially planned. As for the new character, her name is Antlia and she works at the apothecary with her parents and siblings and siblings' spouses. It's a large family which you'll see more of in future pages. I wanted to include one large, close-knit family since so far all the other characters have small families and are fairly independent from them, so the final main character, introduced on next week's page, is a little more reliant on her family than Canan, Asher, Kasumi, and Lilith. I also wanted to include a large family after reading Otoyomegatari (A Bride's Story) because it presented a really interesting family relationship/dynamic I haven't really seen much in my life where everyone works together and relies on each other and I wanted to try working with that kind of relationship. Antlia is also, thus far, the youngest character introduced at 13 years old (if we're not counting Asher's younger sister that appeared in his photo on the chapter cover art). She does have a younger sister though, and a younger cousin but they'll show up later. I dont think she yelled loud enough. Great job with that first panel. I think Antlia is pretty...and loud. Thanks ^u^ And haha yeah she is. Thanks so much! I'm glad you like them I did slave away over them for a good couple of hours. 8:00-17:00. Either a day on their planet is longer than ours, or they have a time keeping system that's a compromise between civilian and military time. They use a 24 hour clock in this particular country. So yeah, kind of a compromise between civilian and military time. I'm gonna like the interior of the shop. I like places like antique shops that have "junk" strewn about. Also your new avatar is really festive and cute. Just like most of the world in written form. Current and former colonies of Great Britain are the exception here - most world use either 24hour clock exclusively or 24 hour when writing and 12 hour when speaking. No privacy, I guess. The whole block knows Lilly got visitors. No privacy, no silence, just constant chaos. That first panel turned out looking really nice. Stuffed animals are necessary in every household. I totally get the Ghibli / new age vibe in the first panel. Wouldn't look out of place in one of their films. Ah great! I'm so glad that comes across so well!